The Xenon-133 Rebreathing System provides the clinician with a simple, safe and inexpensive method of administrating Xenon-133 to perform perfusion steady state and washout studies. A 35 liter bag provides ample volume for patient maintenance and collection of expired Xenon-133. This disposable system is constructed of a non-permeable plastic, thereby precluding xenon absorption or transfer through the device’s components. The system is designed to accept any xenon syringe/gun administration system. 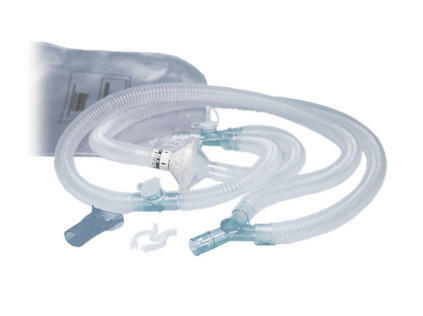 Choose the mouthpiece (060-133), or the air-cushioned face mask with direct dose administration (060-137). Each kit comes as a complete disposable system including a pre-filled Soda-Lime absorber cartridge. *NOTE: Each kit is sold in multiples of 5.